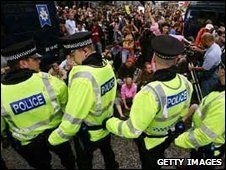 Known activists are planning in an "unprecedented" way ahead of next month's G20 summit in London, the Metropolitan Police have warned. Cdr Bob Broadhurst, in charge of the policing operation, said anarchists and environmentalists were plotting a series of demonstrations. Groups active in the late 1990s were re-emerging and forming new alliances to protest at the meeting, he said. The operation will involve thousands of officers and cost an estimated £7.2m. World leaders, including US President Barack Obama, will begin to arrive in the UK on 31 March. The next day campaigners are expected to target the City of London in a series of anti-globalisation and climate change demonstrations. As the G20 summit begins on 2 April, protests are also planned at the Excel conference centre in Docklands. Cdr Broadhurst said officers from six forces would be involved in a massive security operation before and during the summit. However, it was difficult to estimate how many protesters would actually turn up on the main day of activity on 1 April. "Clearly there are some very innovative and clever people and they know our tactics," Cdr Broadhurst said. "They want to stop the City on the Wednesday - that is their avowed intention." He said it was his aim to "facilitate lawful protest" and he revealed plans for a special demonstration pen near the Excel Centre to accommodate a few hundred protesters. But while police had worked closely with some campaigners, the plans of other groups were harder to ascertain. "Anarchists by definition won't come and see us," he said. He said there was no intelligence to suggest there was a terrorist attack planned, but there was evidence that groups not seen since the 1990s, such as direct action exponents Reclaim the Streets and the Wombles, were re-forming and planning activity. Students were also involved in larger numbers than before, he said, and there was some evidence that foreign activists were heading to the UK to take part in the protests. Police are expecting activists to block streets and hold demonstrations heading in several directions at once. "Hitting us at the same time for a day, that is the stretch, that is causing the issues, rather than protecting people, which is our core business," said Cdr Broadhurst. He added: "There will be times when protest comes up against security and they are not always happy bedfellows." Cdr Broadhurst said police were facing a particular challenge during the G20 because it falls in the same week as a state visit from the president of Mexico, the England football team's games against Slovakia and Ukraine at Wembley and the Boat Race. Met Commissioner Sir Paul Stephenson admitted policing the summit and protecting the 20 world leaders and 40 delegations was a "huge challenge".